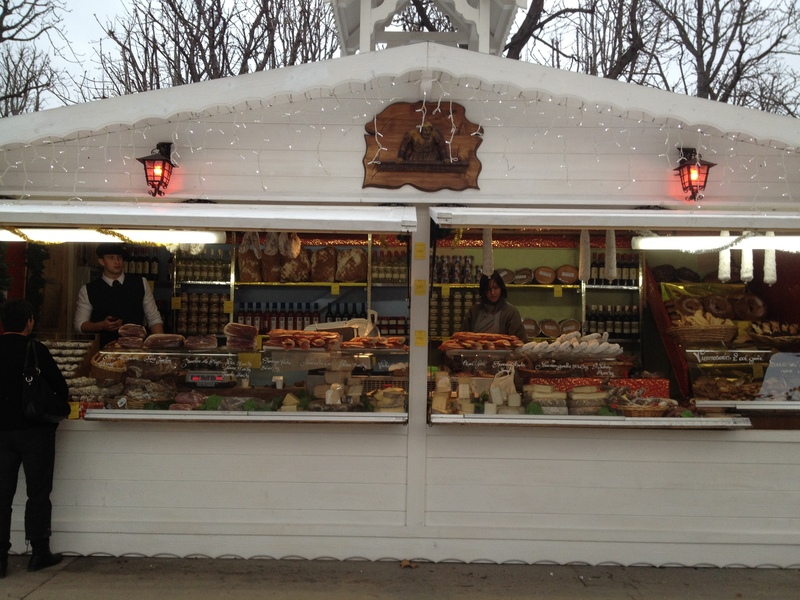 ← Happy Thanksgiving from Paris, where it’s just another day…..
Thanksgiving in Paris? You bet. We did it! 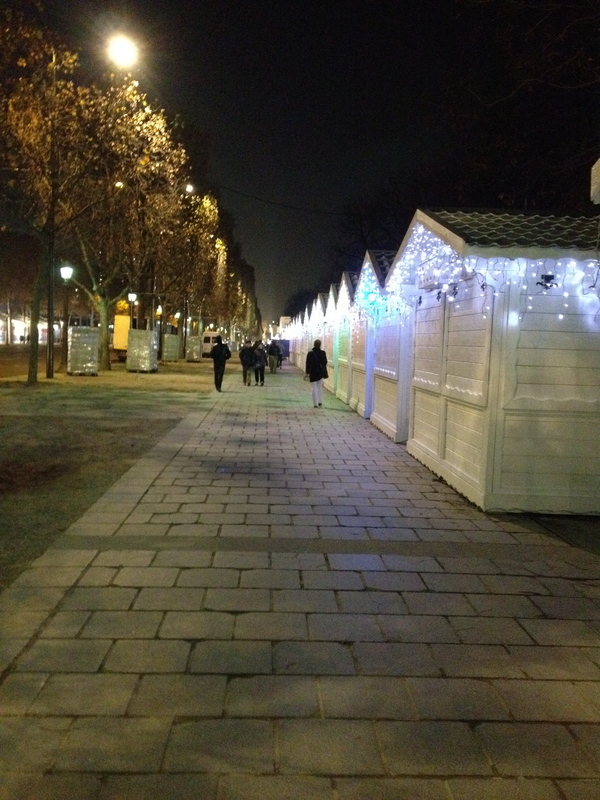 We celebrated our first holiday in Paris and it wasn’t half bad. The key, I think, is to have a full table, both on the surface and on the perimeter. Our group of eight fit comfortably around my table, and while it wasn’t the feast we traditionally have, no one left hungry. I bought a cooked turkey and some dressing, we added some of our favorite sides, and Mlle. 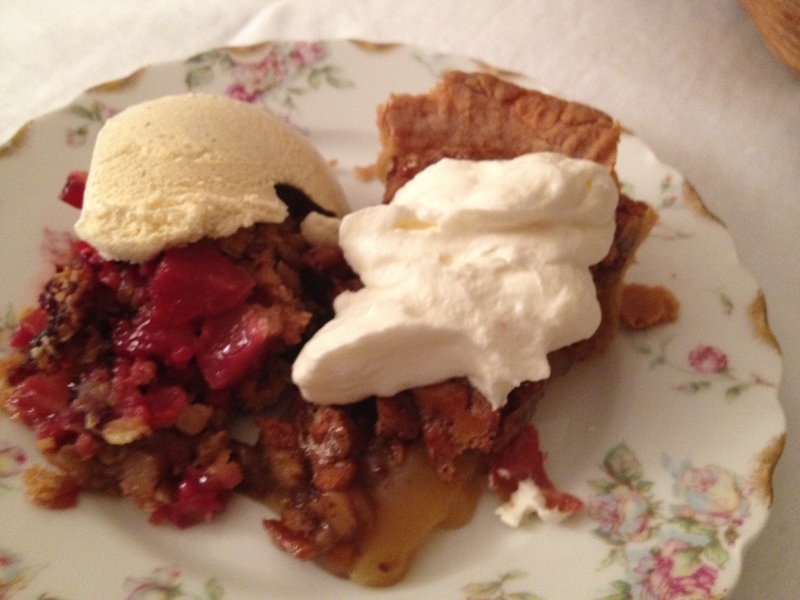 Cordon Bleu provided the pecan pie and the mixed fruit crumble. Voila! Can I tell you how good that pecan pie tasted? Oh my. 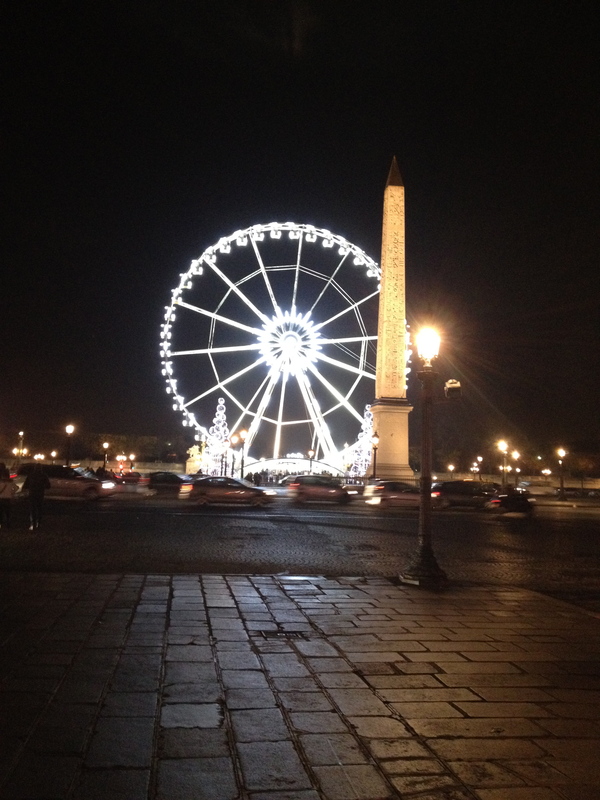 After dinner we strolled down the Champs-Elysees to the ferris wheel at the Place de la Concorde. The lights were beautiful from up there. Unfortunately, I could not get a photo because the compartment was too caged, but here is how it looks from the ground. Of course the Eiffel Tower waited to twinkle until we were being unloaded on the ground. We were willing her to do it while we were up there with her, but she can be a real twit. Here she is after we got down, busting some moves and showing that we are not the boss of her. Sorry- my videographer couldn’t figure out how to rotate that video. 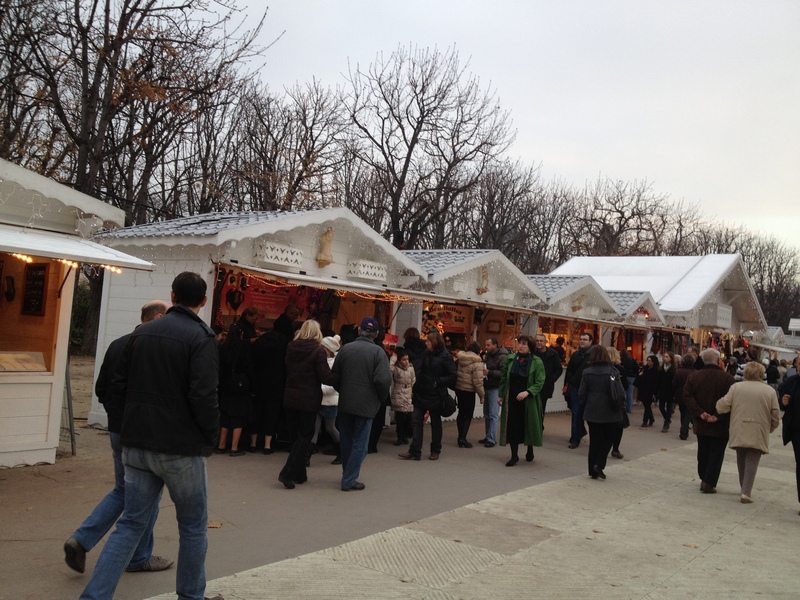 The Champs-Elysees has been transformed into a Christmas marketplace, complete with lights and piped-in music and all types of food, drink, and merchandise. So that is how our first Thanksgiving in Paris went down. I was thankful to be in this amazing city with friends and family, and also thankful for all of you back home who are so supportive of our ex-pat adventure. 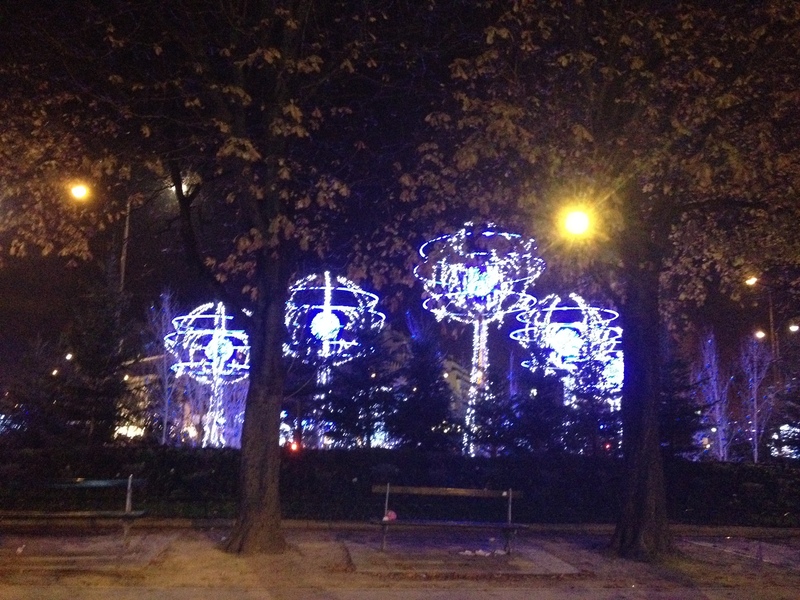 I have taken beaucoup pictures lately, mostly of Christmas and fall in Paris, both of which are pretty darned photogenic. I will be posting those starting tomorrow. I am suddenly feeling a tad behind in my domestic duties, so this may turn into a photo blog for the foreseeable future. Or maybe I will just blow all that off and sit here in front of my computer and ramble to you guys all day. 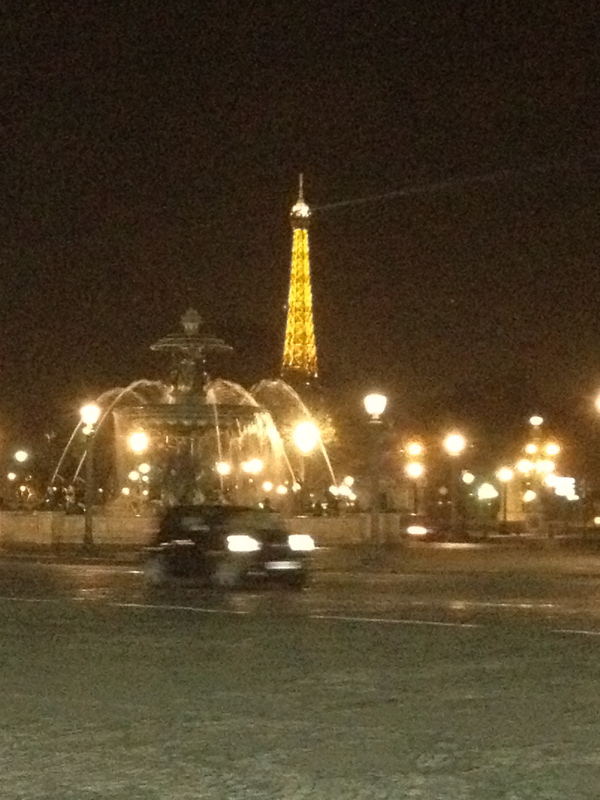 One just never knows what the next day will bring in Paris. Y’all come back- ya hear? Oh and there are your great grandmother’s gorgeous Limoges plates! You could have had more to dinner except for my unfortunate dishwashing debacle which left you with one less. Glad to hear that you had a good Thanksgiving in Paris. Congrats to Mlle Cordon Bleu on a delectable looking pecan pie. 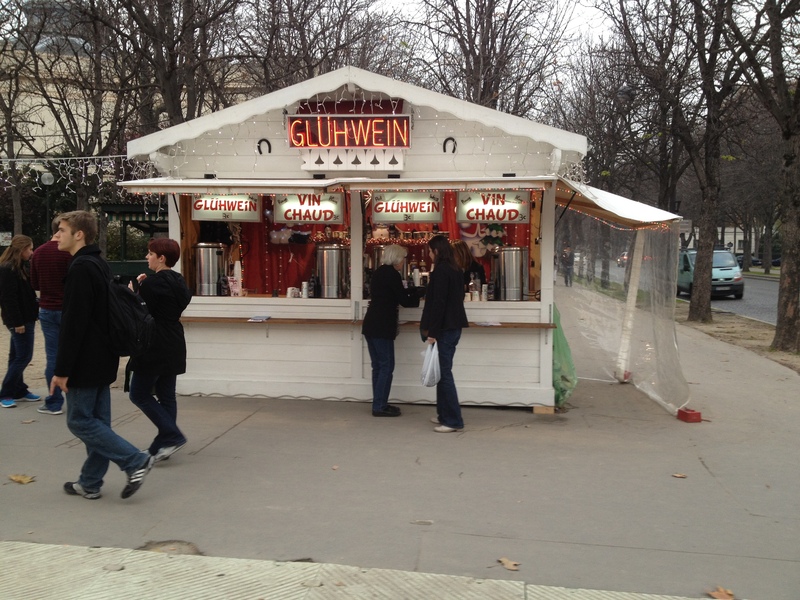 I’ve only seen the Christmas Market when it’s swarming with people. It looks as if early morning is the time to go! And domestic duties – they’re hard to do when Paris is waiting outside your door. I’m so glad you had a nice Thanksgiving. We had a quiet one at home with just the four of us, but we loved seeing your wonderful son and meeting his adorable girlfriend on Friday. Hope to see you all in a couple weeks!